Convenience: Funds make it possible to invest small sums into a large, professionally managed portfolio of bonds across multiple issues and maturities. Dividend reinvestment: Funds make dividend reinvestment efficient and effortless. Costs: Individual TIPS bonds can be purchased at auction and held at no cost. A fund will have an ongoing expense. Volatility: An individual buying and holding to maturity an individual TIPs bond, or a fixed bond ladder, will receive upon maturity an inflation adjusted return of principal. A bond fund does not mature, and an investor must sell at current market value, which may be higher or lower than the inflation adjusted principal value. TIPs funds are available across a range of maturities. The most common division is between short-term bond funds and long-term bond funds. Three components make up the returns of a TIPS bond: yield, inflation adjustment and market value. These factors are the fundamental features of bond fund total returns. The yield of a TIPS bond is fixed at auction. This yield is normally lower for short-term bonds than for long-term bonds. Thus, a short-term TIPS fund will usually have a lower yield than a TIPS fund with average intermediate or long-term maturity. The yield curve chart, showing annual yields for various maturities, illustrates this typical pattern in yields. A negative interest yield has been realized by shorter maturity TIPS in recent years. In the case of auctions producing yields lower than 0.125%, the Treasury provides a 0.125% fixed coupon for the bond, and adjusts the principal value to a premium over par value. The fixed yield is applied to the value of the TIPS bond principal value, which adjusts for changes in the consumer price index. Thus, interest payments will also be inflation-adjusted. TIPS bonds pay interest semiannually. TIP bond funds distribute income dividends monthly or quarterly, depending on the individual fund. TIPS bond principal is tied to the non-seasonally adjusted U.S. City Average All Items Consumer Price Index for All Urban Consumers (CPI-U) published by the Bureau of Labor Statistics of the U.S. Department of Labor. 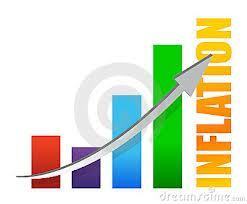 With inflation (a rise in the index), the principal increases. With a deflation (a drop in the index), the principal decreases. The inflation adjustment is equal for all TIPS. Thus this component of return is equal for both short-term and long-term bond funds. In order to maintain the purchasing power of their fund investments, investors should reinvest their dividend distributions. Once a TIPS bond begins trading in the market, its price will fluctuate until it matures. These changes in value are the result of changing investor preferences, liquidity factors, and most importantly, market interest rates. When market rates rise, existing bond prices fall; when market rates fall, existing bond prices rise. Composition of US TIPs Returns, Barclays US TIPs Index 2001-2010. Source: Investment Insights: Inflation-Linked Bonds For Long-Term Diversification, TIAA-CREF. The changing market value of TIPS bonds is an important factor for bond funds because they generally maintain a given short-term or long-term maturity level, so that price change is a considerable element of annual total return. The magnitude of the rise and fall in price is a function of a bond’s maturity and coupon interest rate. The changes are greater for longer maturity bonds, and are greater with lower coupon rates. The table below shows the standard deviation of TIPS bond index returns over various time frames (2003 – 2013). As you can see, long-term bonds have larger fluctuations in value than do shorter maturities. Yield, inflation-adjustment, and price changes in market value (minus expenses) all serve to make-up the total return of a bond mutual fund. Total return will not directly match annual inflation. For example, over the 2003- 2013 period, TIPS total returns exceeded inflation seven times, and lagged inflation four times. Short-term TIPS total returns tend to have higher correlation with CPI inflation than do longer-term TIPs, although the lower interest earned typically results in lower compound returns. The chart below shows the relative annual returns of long-term TIPS, short-term TIPS, and inflation. 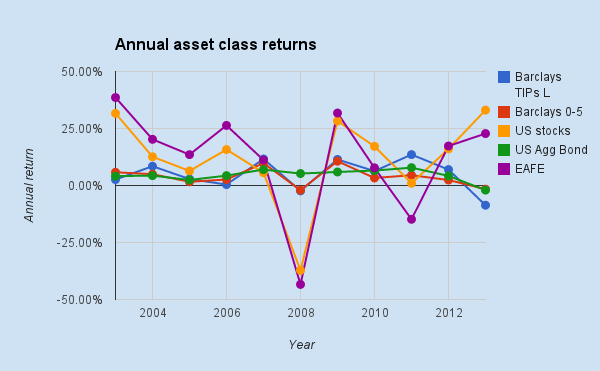 The table provides annual total returns. The table below provides compound returns for TIPS indexes. TIPs are often used as an asset class for diversifying a nominal bond allocation and as a risk reduction diversification for equity investments. The ease of investment and reinvestment makes a bond fund a convenient vehicle for adding TIPs as a risk reduction element in a portfolio The following chart shows annual returns for U.S. short-term TIPS; U.S. long-term TIPS; U.S. Aggregate bonds; U.S. stocks; and EAFE stocks over the 2003 – 2013 period. We can note that both TIPS and nominal bonds served to temper equity losses in down years for stocks (2008 and 2011). Mutual fund investors can combine a short-term TIPS fund with a longer-term TIPS fund to approximate a desired maturity level. Many funds are load-funds, meaning that an investor must pay a hefty sales commission to purchase or sell the fund. Many funds have high expense ratios. As with all bond fund investments, keeping costs low is critical for increasing long-term returns. There are very few TIPS index funds available to the mutual fund investor. The Schwab Treasury Inflation Protected Securities Index Fund (SWRSX ) and the Vanguard Short-Term Inflation-Protected Securities Index Fund admiral shares (VTAPX) are the current offerings. Vanguard also offers a very low cost (0.20% ER) actively managed long-term TIPS fund that is a suitable option for investors who prefer mutual funds. Most of the current TIPS index funds are offered as exchange-traded funds, included in the tables below.